At the age of 7 yeas old, I knew about the famous rescue of the 500+ American airmen by General Draza Mihailovich and his Serbian Chetniks because my father, Milan Karlo, published Nick Lalich's complete day-by-day diary in his magazine called American SERB LIFE in 1948. The magazine was short-lived due to the money investment involved, but it served its purpose nobly, standing as a strong sentinel down through the years, a beacon of undisputed proof, no matter the attempts to hide the information from the American people, and indeed the world. These two covers of the May and June 1948 issues featured St. George and Bishop Nikolai Velimirovich. 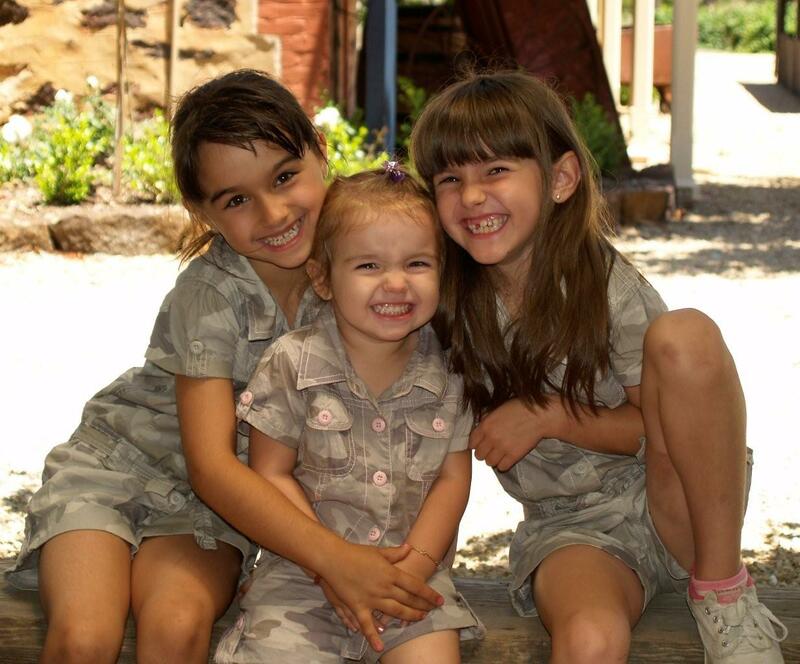 Nick Lalich's diary was published in a series of articles due to the length and wonderful photos included. The articles were entitled: "I Was With Mihailovich"
Here's a close-up of the U.S. pilots sleeping in a loft. Most of the time, the villagers gave the pilots their own beds, and the Serbs slept on the floor. They fed the airmen even though there would be nothing left for themselves or their family members! The US fliers loved the Serbian villagers and couldn't understand how America could have been so bamboozled by the English moles into supporting Tito instead of Mihailovich. The airman in the middle is Curtis (Bud) Diles, now of Dayton, Ohio. This is his whole crew. Bud said recently in an interview in Ypsilanti, "My 15 grandchildren, my 3 Great-grandchildren wouldn't be here if it weren't for the Serbs! I may be old, and I may be forgetful, but I will never forget the man nor the Serbians who cared for me in 1944." *The photo 'The Serbs have saved more than 600 American Fliers' holds vivid memories for me. I learned of the photos existence fifty years later while visiting in Chicago. Obviously, all the fliers were exhausted and sound asleep in the photo. Having said that, obviously we did not know of the photographers presence. While in Chicago in 1993, I met the photographer, quite by accident. He was as much surprised to meet me as I was to meet him. His name?… J.B. Allin, who was attached to the Halyard Mission. This same photo appeared on page 49 in the November/December issue of Serb World, U.S.A.
“Nick” Lalich was a very good friend of mine in 1944 and continued to be a life-long friend until his recent death. "The same photo has appeared in many publications during the past sixty years. "However, I have never seen the men in the photo identified. I knew all of them, quite well. "They were the enlisted men of my B-24 Liberator Bomber Crew, shot down by German anti-aircraft fire over Belgrade on Sept. 8, 1944. Only two of them are still living, including myself. "Left to right in the photo, they are Howard Ford, ball turret gunner; Gerald Wagner, radio operator; Curt Diles, nose turret gunner; Rudolph Schmidt, Flight Engineer; and Leland Porter, tail gunner. One of our crew, James Barker, was captured by the Germans and spent the balance of the war as a German prisoner. "The American Srbobran has published many of my articles over the past six decades. 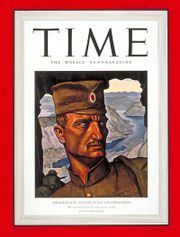 TIME Magazine had Chica Draza Mihailovich on the cover of their magazine and people around the world hailed the leader and his heroic resistance fighters in 1941, the FIRST to stand up to Hitler's Germany. My copy of the LIBERTY magazine from April 25, 1942. "The Story of Draja (Draza) Mihailovitch (Mihailovic/Mihailovich) -Fighter for Freedom." A photo of some of the airmen with Nick Lalich with hat. 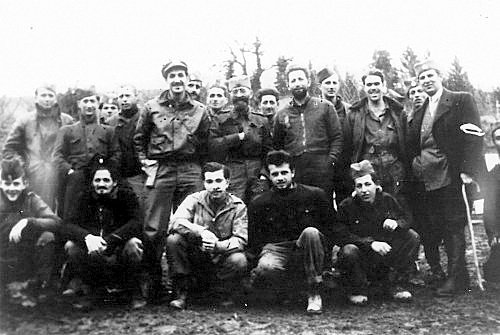 Radioman Arthur ("Jibby") Jibilian is kneeling in light-colored jacket in front. To Lalich's right in a "sjakaca" hat is Bobby Marjanovich of Aliquippa, PA, who was studying for the priesthood in Belgrade, and was rescued by the Maksimovich Brothers singers when the unexpected bombing of the city by the Germans began. The ACRU & Medical Team. 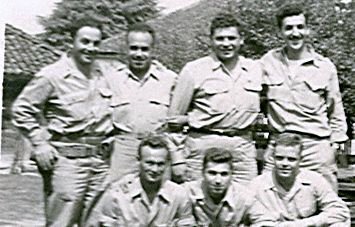 Note George Musulin (3rd from left), hugging Nick Lalich in the back row. The "Milosh Obilich-Kosovo 1389-1937" button from Wilmerding belonged to him! (See Kosovo page) Don't ever let ANYONE ever steal your history! Pittsburgh's Musulin was the person initially dropped behind the lines in charge of the Mission, replaced by Lalich. Jibby in the front middle. 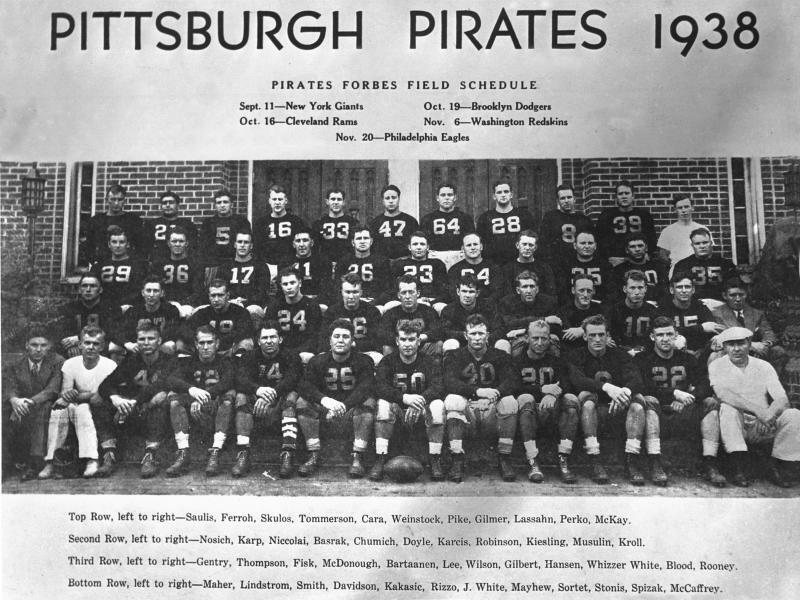 Thanks to my cousin, Lou Astorino, I was able to secure this photo of George Musulin being on the 1938 Pirate (now Steelers) Football Team, working for Art Rooney before working for the OSS! George is in the 2nd row from the top, next to the end on the right hand side. George was replaced by Nick Lalich as the head person in charge of the Operation Halyard Mission, as he caught onto double-agent dealing English dirty spy tricks and they wanted him replaced. Read the book: THE FORGOTTEN 500 to learn more! Here's Jibby at the Museum in Serbia, when a few of the remaining airmen visited there. Many thanks to Jibby for sharing some photos! 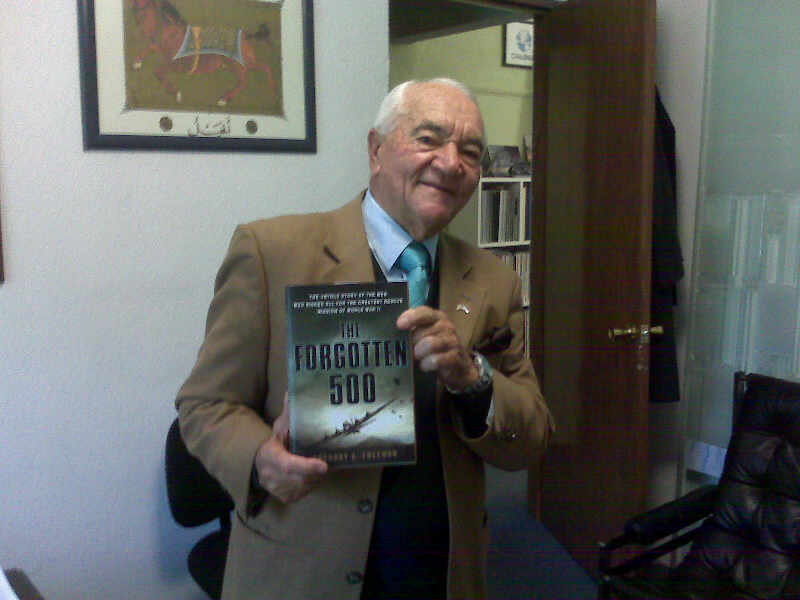 To read more about the FORGOTTEN 500, order the book. You'll be glad you did! Last mission out! Back safely in Bari, Italy! To the far right is George Vuynovich, who was born on Pittsburgh's South Side right behind from where the American Serbian Club is now! He graduated from Ambridge High School and was an SNF Stipendist in 1934. He married a beautiful girl from Serbia while there. To read more about how "George" led the mission to rescue the men, read the book! 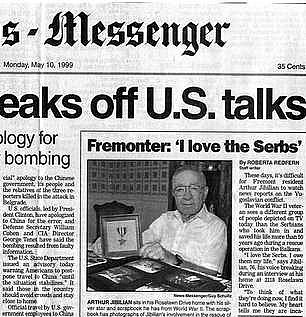 Here's Jibby in a May 10, 1999 paper: "I LOVE THE SERBS!" And the Serbs love Jibby, too! He's the last surviving member of the team that rescued the 512 airmen that was in Yugoslavia. George Vuynovich, the officer in charge in Bari, Italy, lives in New York. Nick Petrovich, an 18-yr. old guard with Chica Draza, lives in Mexico. Former U.S. Airman Carl Walpusk and his lovely wife Virginia, with a statue of Draza Mihailovich, the man who saved him! Jibby's daughter Debbie, Vangie, Jibby, Sam & Sue from St. Clair Shores, Michigan, and me holding the Serbian flag on the field of 512 American flags, Father's Day week-end, June 15, 2008 at Metcalf Field in Toledo, Ohio. Here's a video clipping of the event from their local WTOL television station! <-----click here. The Toledo Blade also had a wonderful story on Jibby and his special day entitled "Fremont Veteran Saluted For Saving Lives of 500 U.S. Fliers," by Kate Giammarise, Staff writer for the Blade. Debbie, Vangie, Jibby, Sam, Sue, Mim, 6/14/08, American Flag Day, Metcalf Field. Serbian flag to acknowledge the contribution of the Serbs and Chetniks to the rescue of the 513 airmen. Jibby is right in front of this photo, next to tall Captain Nick Lalich in this WWII photo. Thanks, Jib! Thanks to Steve Crum, of the AOPA Flight Training School at Metcalf Field (TDC), and photographer for the Toledo Television station, we have these photos of Jibby and his special day! Here's Jibby in front of a C-47, like the kind used to rescue the U.S. airmen. This plane was at the not-so-far away Yankee Air Museum. Riding in the B-17 Bomber over Toledo Skies! The Truth About Draza Mihailovich! Be sure to read about General Draza Mihailovich being honored in the U.S. Congress on the Helen Delich Bentley "page" found here on this website! Who can believe the next events described here? God bless the EAA #582 airmen from Metcalf Field in Toledo, Ohio! The pilots, led by their President Bill Hilzel, gave of their time, treasures and talents. 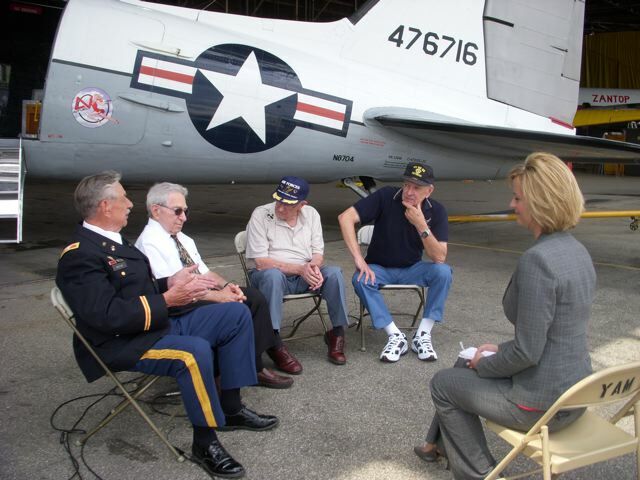 They picked up several rescued airmen and me from various places around the USA and flew us to the Yankee Air Museum in Ypsilanti, Michigan on Monday, June 23, 2008, to meet Jibby and WTOL 11 reporter for Toledo's News Leader, Jennifer Boresz. It was an incredible experience! Jibby and Clare are holding 2 different issues of my father's magazine published in 1948 called AMERICAN SERB LIFE. The day-by-day rescue of the airmen was documented in the diary of Nick Lalich that my father published in his short-lived publication due to monetary issues. What a thrill it was for me to see them holding these! It was living history at its best! 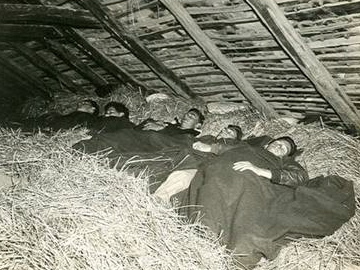 Remember the photo of the airmen sleeping in a hay loft published in my father's book up above? The fellow in the middle is our Curtis ("Bud") Diles shown here! He wanted us to see the documentation he has on his Serb rescuers. Bud has written many letters to the editors and has given several lectures on his debt of gratitude to the Serbian people, even during unpopular times. He's a true-blue friend! Why? He says his 15 grandchildren and 3 great-grandchldren wouldn't be here if it weren't for his Serb rescuers! Here's a good story----one day Bud's grandson came home and showed a TIME-LIFE book he had taken out of his school library to his mother with a photo of the airmen in the hayloft. Imagine his surprise when Theresa, his mother, replied, "That's your Grandfather in the middle!" Can you guess how I felt being next to these great heroes? I've "known" Jibby since I was 7 years old. And I met Bud and Clare before, but I didn't know until THIS day, that Bud was the man in the haystack! Bud had us on a role as he joked, "Every day we risked our lives running from the enemy and almost starving to death, and this photo of "sleeping on the job" is my legacy?" That's why we're all smiling! Jibby wants to make sure he gets a "good shot!" Goodbye, Yankee Air Museum! What a great time! What a scene to remember! Jibby in front-back left to right- Bud Diles, Carl Walpusk and Clare Musgrave! Here's a bit from History! Mike Sudjovic, from California (far right above photo) has been collecting information about Operation Halyard for years! The U.S. airman, G. B. Allin, the photographer for Operation Halyard, left him all of his original photographs when he passed away. Interestingly enough, Bud Diles met Allinn at a Conference one year, almost by accident! And one of my favorite photos! Jibby says to stay tuned for more! It's not over yet! WOW! Photo courtesy of Steve Crum from WTOL TV, Toledo! 16 yr. old Nick Petrovich, with Cica Draza's Chetniks. Golf Champ (Seniors!) in Cancun, Mexico, 2008! Read a Book Review HERE of the Forgotton 500 by Rev. James Thornton that was written in THE NEW AMERICAN magazine, and posted on the Serbian Orthodox Church in North and South America's website. His Postscript is most telling! Inside cover of LET MY PEOPLE GO.See Pranjani, middle right. 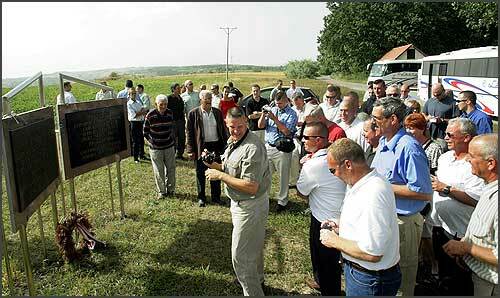 Ohio National Guardsmen and the Serbian citizens of Pranjani visiting Galavica Field, which served as an airport for the evacuation of U.S. airmen caught behind German-occupied lines in the former Yugoslavia. American Ambassador Munter (center) with Dragan Vidakovic (left) whose house was used as Headquarters during the rescue operations! Here's Colonel Jerry Rees, head of the Ohio delegation, thanking the hosts by presenting the State of Ohio Flag to the head of the Pranjani community, Mr. Dragan Veselinovic. Lt. Col. John Cappello (center), who arranged the Ceremonies between the Ohio National Guard and the Residents of Pranjani, Serbia, shown here attending a reception honoring the visit of the Kosovo Men's Choir from Ohio at the home of Ms. Jennifer Brush, Charge d'Affaires of the Embassy of the USA, Thursday, August 14. From Serb World's article on Nick Lalich. Dear Friends at the WWII Memorial Museum, A Christmas Present for You, TOO! I want to let you know that on Dec. 7, 2008, the OPERATION HALYARD mission was finally brought to the fore on U.S. Government military soil. The place was the 180th Fighter Wing of Ohio's National Guard in Toledo, Ohio. The whole auditorium was packed for a Congressional presentation to Arthur ("Jibby") Jibilian, radio man for the famed mission that was only recently declassified, and a book called the FORGOTTEN 500 was written about it. From there, things started to snowball. A member of the EAA#582 (Experimental Aircraft Association) read the book and shared it with another pilot. They found out that the radioman, Jibby, lived close to them. Why, being airmen and being interested in Aviation History all their lives, why......they asked themselves, why did they not know about this? How, if this is the largest rescue from behind Nazi Germany occupied lines in Yugoslavia could this be covered up for so long? They started to make things happen. The Toledo BLADE and TV Station WTOL joined in as interested community partners. The Toledo based EAA#582 had a "Fly-by" for Jibby on Flag Day, June 14, 2008, which also just happened to be Father's Day week-end. Here was an American Hero if there ever was one that no one knew about, who helped save all of these 512 airmen so they could come home and become fathers and grandfathers. The role of the Serbs, the people who rescued, fed and defended the airmen with their lives was briefly mentioned there too, when I appeared with my father's magazines from 1948 which I talk about later in this letter. On the field were 512 American flags, each one representing an American flier who was rescued and came home. 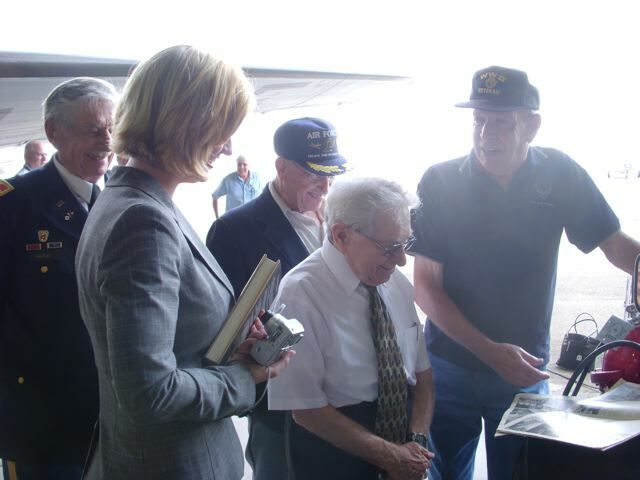 Not even two weeks later, several of the rescued American fliers, including a fellow who lives by me, tail gunner Carl Walpusk, and I were flown to Ypsilanti Air Museum where the men were interviewed by TV reporter, Jennifer Boresz. Those clips professionally done by WTOL can be found on their TV site and are so interesting to hear. But this latest tribute was out of this world. Something I could never imagine happening, did! It took place on U.S. Government military soil and the secret hushed-up story was revealed to all present, including so many of our young American airmen and women. A band played inspirational music at the beginning. Bill Hirzel, President of the EAA gave opening remarks, followed by a presentation by Dan Weise, also from the EAA. I then gave a presentation on behalf of the Serbs who rescued, fed, and guarded the airmen, sometimes at GREAT cost to themselves and the expense of their own lives. Next, U.S. Representative Marcy Kaptur spoke, followed by U.S. Representative Robert Latta. Marcy Kaptur and OHIO led the way in making sure the WWII Memorial was built in Washington, DC. Bob Latta was EXCELLENT in explaining the details of the bombing mission over the Ploesti Oil fields as he's a true military historian too. 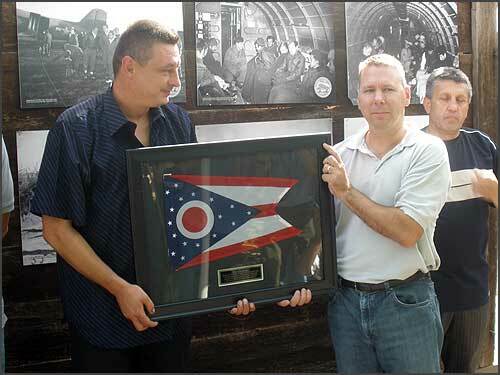 Then Ohio State Senators Teresa Fedor and Mark Wagoner spoke and presented Jibby with an Ohio flag. Maj Gen Harry "AJ" Feucht, Jr. did a great job, also, in explaining the mission, followed by Col. Mark Bartman, another excellent presentation explaining the connections of the base with the activities of the day. Jibby himself finally spoke, refusing to sit in a chair. He was excellent in his remarks and saying how we owed an apology and a great deal of thanks to the Serbian people for what they did. Bill David and Brian Mahon from the EAA who worked so hard to bring this day to fruition also spoke briefly. They recognized the organizational contributions of Capt. Gary Bentley from the 180th Fighter Wing for his tremendous efforts also. Bill Hirzel recognized others in the crowd, including V. Rev. 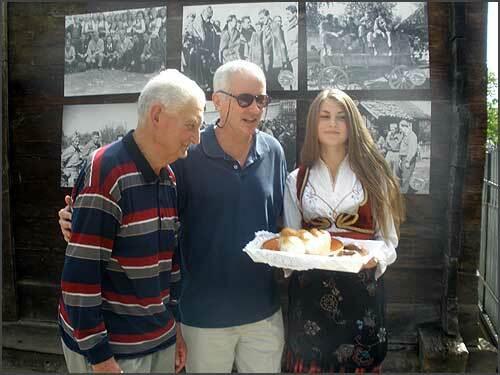 V. Sokolovich, retired priest from Cleveland, who showed a photo of his father as the Priest confessor to General Draza Mihailovich and his Chetnik troops. His father was killed by the Communists a few days after the mock trial of Draza Mihailovich because he was with Draza. Another American Serb, Dr. Ljubomir Vujovic, came in from New York, representing the Tesla Memorial Society and spoke about life with the Chetniks. Mr. Dushan Mandich, representative of the American Chetniks, was also present. I want you to know that I knew about this famous rescue from the time I was seven years old. My father published the complete diary of OSS Capt. Nick Lalich, the person in charge of this mission, word for word, in my dad's short-lived magazine AMERICAN SERB LIFE in the May, June issues of 1948. Nick, Jibby and George "Gov" Musulin were always my real-life heroes. I was so happy when the book finally came out last year. After 60 years of being hushed up! Well, I was almost delirious with happiness on Sunday, Dec. 7, 2008. It was all so exciting! From Nick Lalich's diary, I know that on Dec. 7, 1944, five more YANKS were brought into their camp for rescue. There was a lull of 3 days before another 10 airmen showed up. Day after day they awaited the final rescue, and finally on Dec. 27, 1944, the remaining troops were flown "home" to Bari, Italy, and the welcoming arms of OSS coordinator George Vuynovich, who helped organize this fantastic rescue. I just want to shout this from the highest rooftops! It was such a wonderful affair people present didn't realize that the supposedly 1/2 hour presentation went on for 2 hours, because everyone loved it! This is a part of WWII history, and I wanted you to be aware of it. Here's Brian McMahon of the EAA#582 with Ohio State Senator Teresa Fedor. Brian worked hard on this program because he and Jibby went to the same high school and Brian wanted to ensure Jibby's place in history! Brian told the TV stations that a movie is next! Beautiful shot! Bill David (EAA Newsletter Editor and so much more!) Brian McMahon in a WWII uniform from his brother's collection, and EAA#582 President Bill Hirzel. To the far right is EAA#582 Dan Weise who has become a real student of this operation, and our Honoree, Arthur Jibilian! They all worked so hard to make this affair a success! And it was! What a great day! 12/7/08! News Flash! Jibby receives greetings from young fans in Australia! Drawing of the Halyard Mission by Helena & Lenora. God bless these young ones! I received the drawing that you girls sent. WOW.....I am impressed!! Thank you so much. I showed it to many people and they are talking about putting it in THE AMERICAN SRBOBRAN. Again, thank you.....you are all beautiful girls, and I know that your parents are proud of you. TV Station WTOL about Jibby's event. "The thing that impressed me most about the set-up was the truly amazing security of the Chetniks soldiers and peasants. The American airmen had been assembled from an area covering many thousands of square miles. Thousands of people knew of their presence in the area. They had been brought together at great risk and at a high cost by the Chetniks. Men had been tortured to death and villages destroyed, by the Germans in an effort to locate them. These poor suffering people, who had been deserted by the American and British governments, and who were under merciless attack from both the Germans and Tito’s Partisans, would have received more money than they could ever dream of earning in their entire lives by tipping off the Germans to the presence of the Americans. But in spite of all that, not one American was betrayed. Their sense of honor and secrecy for the welfare of their beloved Americans was so great that they never even discussed their presence among themselves. Without this heartshaking loyalty, our entire mission would have been fruitless, and not one airman would have had a chance to escape. " THE HEROES OF OPERATION HALYARD. We're all excited for Jennifer and wish her many, many more well-deserved awards! Not only the people in Toledo, Cleveland and Columbus, OH are singing her praises, but the WHOLE USA & MORE! Congratulations, Jennifer Boresz and also to your whole WTOL team of Toledo, Ohio! Also kudos once again to the unselfish EAA#582 airmen who made sure all the rescued airmen, Jibby and Jen got to the Yankee Air Museum for the Interview! And me too! I'm so glad Carl Walpusk and I got to witness this event FIRST HAND! My little American/Serbian flags are now famous! Mim xoxoxo We Love you, Jen! "This is my first time being nominated for an Emmy and I am thrilled that it is for this story. Thanks again for all of your help and congratulations!" "Dear Jen, the story has now reached the heart of the nation. Thank you, thank you, so much. Jen, I had a feeling that you were destined for great accomplishments.....and you are proving me right. Kudos to both of you and WTOL!!!! You may be assured that we will all do our best to keep this story "live" until Mihailovich's name is cleared and the Serbs receive recognition for their care of our boys." "Tonight, June 5, 2009, when I opened my email, my PC monitor lit up like Times Square on New Year's Even with Jennifer's news of being nominated for an Emmy. If those "Forgotten 500" Airmen were still among the living, she would be a "Shoe-In!" I must tell you my reaction to her nomination. As a twelve year old in my home in Portsmouth, Oh, i was a newspaper carrier and was delighted every time to see a News Story so important it demanded an EXTRA EDITION. The EXTRA caused a lot of excitement for everyone and also meant more money in my pocket. READ ALL ABOUT IT! During WWII the AAF ACRU known as "Operation HALYARD" along with the former Serbian leader Draza Mihailovich rescued more than 500 Airmen from beneath the noses of the German enemy. Perhaps Jennifer's nomination will act as a catalyst for Col. John Cappello's coming story about Halyard. Also, I can't help but think.... "If spirits can smile, Capt. Nick Lalich is leading the way!" Congratulations, Jen! We're all proud of you! Much thanks to David Vuich and Aleksandra Rebic for sharing this find with us. Of tyrants and proclaim the prophets true? And sanctuary and penance for wrong power? For utterance that salves us if not saves. Why should we ape the silence of graves? And even these have epitaphs as tongues. Let one small voice salute the Serbian. With shame at first, then prayer for that brave man. Covered Up for Years to Appease Tito and His Communists. Why did the Allied press which had made a great hero of Mihailovich as a resister of Axis invaders of Jugoslavia begin to play him down after 1942? What was Tito's past? And where was the radio station located that heralded his appearance in Yugoslavia? What decision was reached at Teheran with respect to Tito and Mihailovich? How was the ALLIED military intelligence about Jugoslavia falsified? Why did Churchill say of Jugoslavia, "I was deceived and badly informed." David Martin was born in Ontario, Canada, in 1914. Before the war he wrote on Canadian affairs for Current History, The Nation, The New Republic, the New Leader and other journals. He joined the Canadian Air Force in October, 1942, became a pilot and flew on the Burmese frontier, being Honorably discharged in 1946. David Martin devoted his entire life to defending the truth and Mihailovich. In his 1990 book THE WEB OF DISINFORMATION: CHURCHILL'S YUGOSLAV BLUNDER, David Martin fully uncovered the tragic tale "found in secret British files that were only recenty and inadvertently declassified. He reveals that Churchill and others were deceived- by Communist moles and sypathizers who had infiltrated the military intelligence services. The prime mover was the famous Cambridge spy set that included Kim Philby, Guy Burgess, Donald Macclean and "Sir" Anthony Blunt. Martin names the "Fifth Man": James Klugman, most brilliant mole of them all." The National Geographic TRAVELER magazine of March 2005 says Blunt's exposure in 1979 as a Soviet spy, after being knighted in 1956 and appointed art adviser to the Queen, was a major embarrassment to the Crown. The book flap description of the book THE PHILBY CONSPIRACY (1968) by Bruce Page, David Leitch and Phillip Knightley, states: "That a son of the British establishment could, during a thrity year career in his country's secret service, at the same time be a dedicated Communist agent would seem too far-fetched even for fiction. "And yet, Kim Philby, like those almost unbelievable spies Burgess and Maclean, IS real and his story is true. He was the link-man between the British service and the American Central Intelligence Agency from which position he was able to betray EVERY most important secret of Western intelligence. I remember attending a 1991 Conference in Toronto entitled "Serbia: The Ally that Lost." David Martin was one of the four main speakers. By this time, the distinguished journalist, political analyst and staffer on the Senate Judiciary Committee suffered badly from Parkinson's disease and could hardly stand, shaking badly. His wife, Virginia, sitting next to him, offered to read his speech. He declined. Writhing in pain as he stood, he threw his shoulders back and proclaimed that he OWED it to the Serbs and Draza Mihailovich to read it himself! "Vejcnaja Pamjat" to a wonderful man! These "Yanks" above were showing their gratitude at the Stevens Hotel rally: John Scroggs of Kansas City, Robert Eckman, David O'Connell, Don Parkerson, John Fox, Peoria; Capt. Nick Lalich, Cleveland; Fred Zuecher, Milwaukee; William Rogers, Manteno; Thomas Pettigrew, David Labissoniers, Milwaukee; Del Salmon, Charles Cracz, Neal Janosky, Milwaukee. 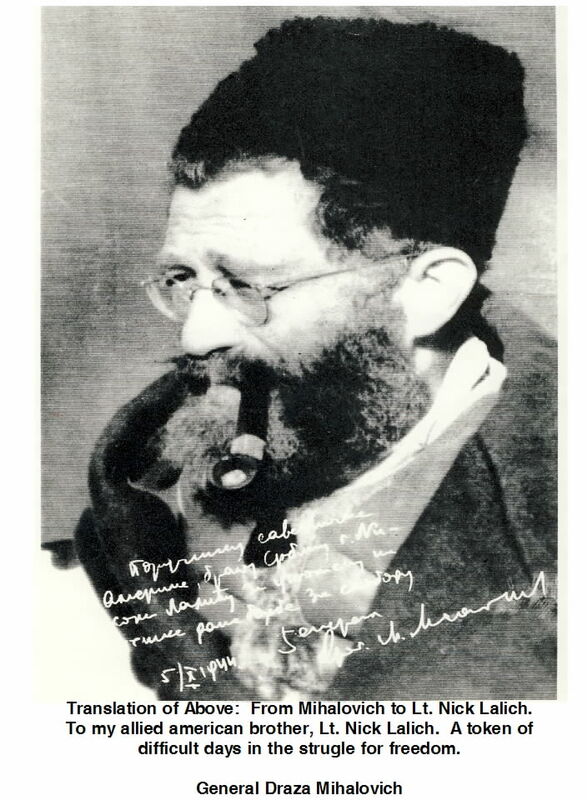 Charles Gracz who then lived on 1411 N. Bosworth Avenue, was quoted in the Chicago HERALD AMERICAN on Thursday April 4, 1946 as saying, "If ever there was anyone loyal to the highest American traditions, it is General Mihailovich and his Chetniks. "The 20 United States fliers were accompanied by wo Canadian veterans. They represent 600 airmen rescued by Mihailovich's forces. Donald Parkerson, Chicago Vet and his wife check out his Chetnik shoe, grateful to be home, thanks to the Serbs! Oaklander Ex-Lieutenant Allen Carrico helped wreck the German Supply Train with the Chetniks and more! (San Francisco Chronicle, 3/29/1946. 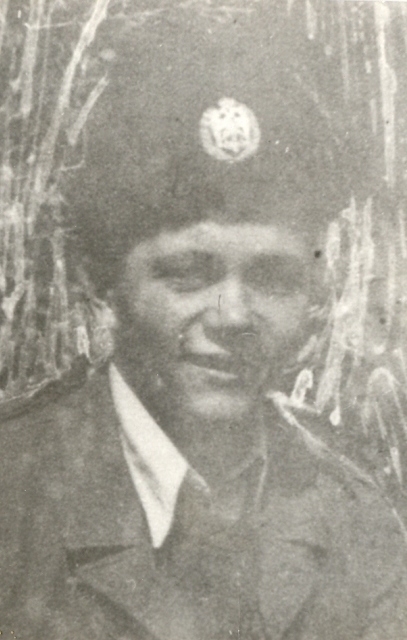 "I'm alive today because of Mihailovich," former flier David J. O'Connell, Jr, age 24. Virginia Walpush remembered the story and quickly found it for me in a book of the gathered stories of the Airmen. "Here," she said. Here's your U.S. B-24 Pilot Paul Mato and his waist gunner, Carl Walpusk!" Jibby was honoroed at the Metcalf Airfied near Toledo, OH on Flag Day, June 14, 2008. The University of Toledo presented Jibby with an award after his B-17 FLY-By. Note the 512 flags on the field behind. Each flag represented one of the rescued airmen. There was a beautiful honor guard waiting for Jibby to alight from the aircraft! Here's the B-17 bomber that took Jibby for a special ride before doing the Fly-by! The airplane is called THE YANKEE LADY! Here are the HEROES in Serbia! Mnogo Hvala to Cica Draza Mihailovich and his brave Chetniks! Jibby in his younger years. Some of the rescued airmen left their shoes/boots for their Serbian rescuers who gave so much to help the Americans! Admiring all the photos of the historic OPERATION HALYARD rescue on display at the airshow at Metcalf Field. Jibby being congratulated by the organizers of the grand event. Note the 512 U.S. flags behind the podium, one each for each American airmen rescued by the Serbs! Mim gives Jibby Certificate of Appreciation for CONTINUED HEROISM, for his defense of General Draza Mihailovich and the Serbian people. Thank you, Jibby, on behalf of ALL of us! Here's looking at super American-Serb History! Jibby always looks out for the Serbs! I've heard him personally tell about the debt of gratitude America owes the Serbs MANY times myself during Interviews and talks with non-Serbs. He's a true friend! Here's Jennifer interviewing Carl Walpusk, Jibby, Clare Musgrave and Curt (Bud) Diles, 3 of the 512 airmen rescued by the OSS team where Jibby was the radioman! 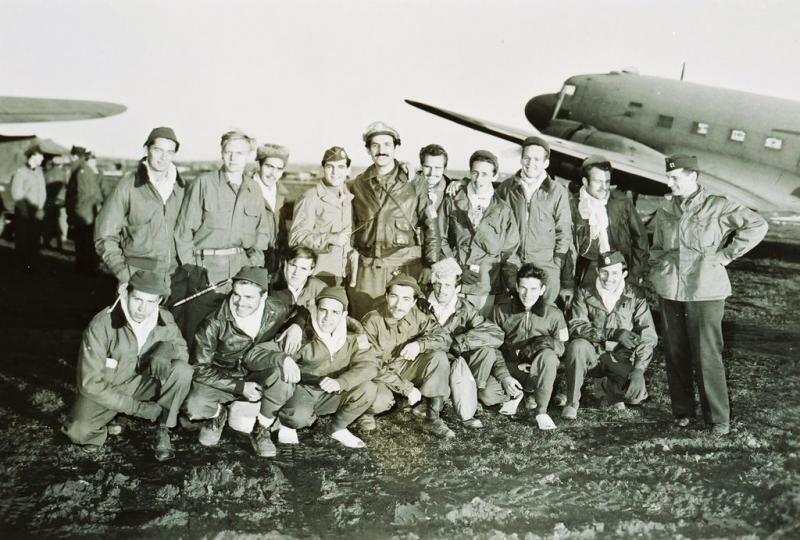 They're shown here in front of a C-47, the type of aircraft that took the American airmen back home! 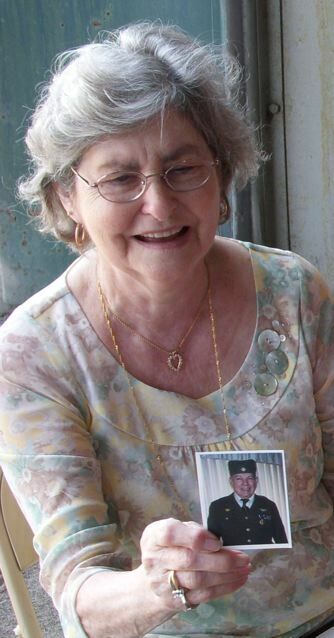 Here's Inez Diles, with a photo of her husband in his American uniform, with his Chetnik "s(h)ajkac(h)a!" Bud showing American SERB LIFE article and photos to the group assembled and making us laugh! Here's how we traveled to get to Michigan, in Dennis Lawrence's "Mooney" aircraft! First our pilot, then I plopped down in the back, and finally Carl could get in and lock the door! Our pilot, Dennis Lawrence of the EAA #582, Metcalf group, and Carl Walpusk. Carl and his wife Virginia and their family. How things could have been different, eh? Carl said although he appreciated the attention he has received, so much more credit should be given to the men of the OSS rescue team who voluntarily risked their lives for the airmen and their Serb rescuers. We'd also like to thank all the airmen from EAA #582 for taking us to Michigan for this historic moment in time! Who can believe it really happened? Here's author Gregory Freeman at a meeting in Washington June 2007 where he received special acclaim for his book, THE FORGOTTEN 500. Here's a photo I took of wonderful George Vujnovich who coordinated the Halyard Mission from Bari, Italy. At 93 yrs. old, and in a wheelchair, George came to Washington, taking a taxi from his home in NY to the train station, and another taxi from the train station to the Longworth House Office Building in Washington, DC. George is another Super Hero! 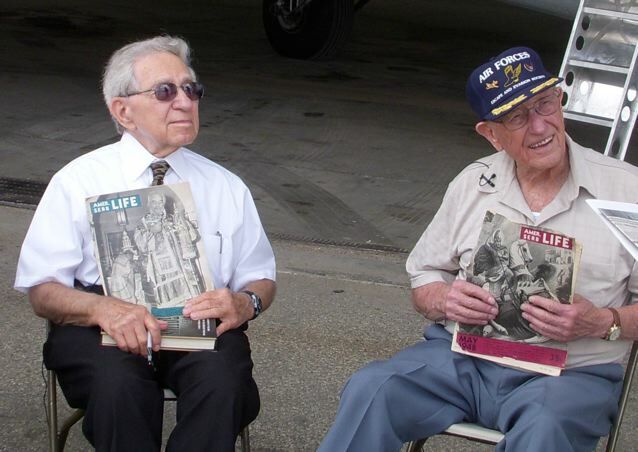 Let's pray that we are as active, spry, and mentally-sharp brilliant as these WWII heroes are when we reach their age! What inspirations they are to all of us! Nick Petrovich, 18 yr. old guard! One of the 512 American Flags (each representing an American Airman rescued in Operation Halyarad) - Metcalf Airfield in Toledo- that was in the field behind the podium. The flag from Jibby was for the American Airman in Mim's hometown rescued by Draza Mihailovich and his Chetniks, and the OSS: Carl Walpusk! Read more about Carl above! Flag for Carl from Jibby! Photo by Savo Subotich who I met that day for the first time! This incredible interview was aired so appropriately on July 4, 2008, on the 5:00 PM news KTOL-TV. Jennifer Boresz and the cameraman and all the people at the Yankee Air Museum were wonderful to all of us! Jennifer, Jibby and the Airmen: Carl, Bud and Clare!To see and hear this historical interview, click on this site below. You are in for a real PATRIOTIC treat! Oh, our Jennifer, our Jennifer! Here's her BLOG about that day in Ypsilanti, Michigan. The Serbs love YOU, too, Jen! I was happy to see the Serbs getting some long overdue credit. Hopefully this will be the start of something. 41 Ohio National Guardsmen receive traditional Serbian welcome of bread & salt, Sept. 6, 2008 at Pranjani! One of the greatest pleasures I had while on my recent trip to Serbia was meeting Lt. Col. John Cappello, USAF Air Attache´, his wife, and members of his staff at the home of Ms. Jennifer Brush, Charge d'Affaires of the Embassy of the USA in Belgrade. 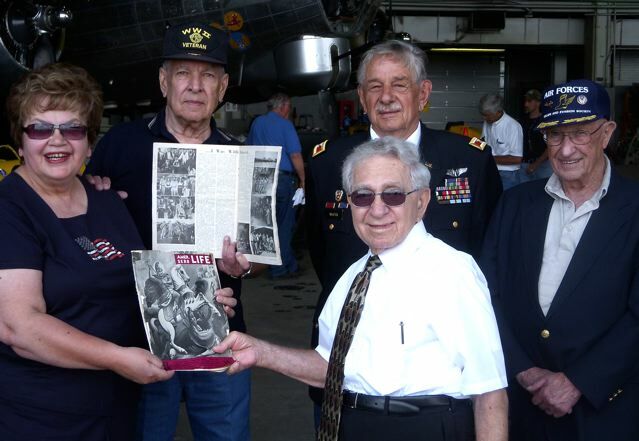 There, I was able to present him with a copy of the American SRBOBRAN, that featured 4 pages of the Tribute to OSS Radioman, Arthur Jibilian, in Toledo, Ohio that I had written up, along with the guest reporter, Jennifer Boresz, of WTOL. It was Jennifer who interviewed several of the rescued airmen in Ypsilanti, Michigan for her TV station. Being in the Air Force, Lt. Col. Cappello immediately recognized the importance of Operation Halyard and is currently working on several projects (Museum/Library, etc.) to help the Serbs from that area as a "Thank You" for their sacrifices. He also helped organize the following event! On September 6, 41 members of the Ohio National Guard participated in the U.S. - Serbia State Partnership Program, arriving in Serbia on an Ohio Air National Guard aircraft. The Ohio delegation included members of the Ohio National Guard Joint Force Headquarters, the Ohio Air National Guard, and Senior Non Commissioned Officers from the Ohio Army and Air National Guard. The Guardsmen met their counterparts from the Serbian Armed Forces and participated in joint activities, including an exercise that simulates the support by military forces to a municipality following a natural disaster. The joint exchanges provided the opportunity to share information between personnel of the Serbian military and the Ohio National Guard and to develop future opportunities for ongoing State Partnership Program activities. 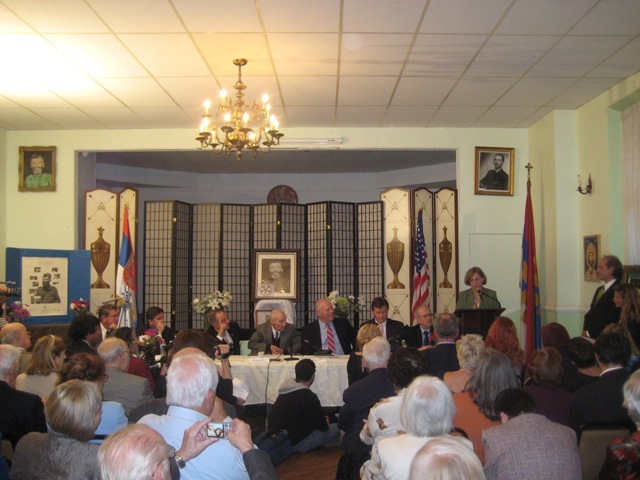 On September 7th, the delegation had the honor to commemorate the historical military cooperation between the U.S. and Serbia during World War II and visit the village of Pranjani, the location of the Halyard Mission. U.S. Ambassador to Serbia, Cameron Munter, also accompanied the delegation. "During the summer of 1944 approximately 1, 000 U.S. airmen bailed out over German-occupied Yugoslavia, a significant number of them landing in Serbia. In a series of daylight and night airlifts, a team made up of troops of General Mihailovic's Royal Yugoslav Army in the Homeland and the Office of Strategic Services (O.S.S.) evacuated over 300 U.S. airmen from the village of Pranjani. The rescue of the U.S. airmen involved small unit actions against German troops and put at risk entire Serb villages that sheltered the U.S. personnel. U.S. airmen bear testimony to the significant sacrifices of local Serb villagers who fed, cared for and protected them, in some cases up to six months." The Halyard Mission is considered one of the greatest rescues of American airmen from behind enemy lines in the history of warfare. Jibby receives WWII framed poster from U.S. Cong. Marcy Kaptur, who, along with her fellow Ohioans led the way for the memorial to be built. In the background is her Congressional Aide, Dan Foote. Bob Chirdon is the General Manager of WTOL. He gave an excellent editorial on TV and you can hear it here below. Tremendous job! we were all so grateful for this! In this film above, Brian McMahon, the organizer of this event, says the next step is to make a movie and his top choices for the film are Harrison Ford, John Travolta, and Tom Cruise! U.S. Congressman Bob Latta was VERY impressive with his knowledge of the importance of the Ploesti Oil Fields to the Allied success and his ability to explain the mission so well. Ohio State Senators Teresa Fedor and Mark Wagoner brought an Ohio flag for Jibby. It was great to learn that Teresa was a former teacher. Here's Maj. Gen. Harry "AJ" Feucht, Jr. giving yet another award to Jibby. Fr. Sokolovich's father, who was one of the 40 priests made saints after being killed for being with the Chetniks. Some of the PowerPoint slide I used for the Serbian recognition part. Jibby signing the book of another Aviator experimental jet craft hero! The great WWII exhibit belongs to the McMahon family member on the far right. Bless this young Guardsman. She said, "I want to be just like you and have all the vim and energy you do when I get to be your age!" And I want to have Jibby's energy and mind at HIS age! My name is Dragan R. and my wife's name is Tihana. I was born in Sydney but lived in Serbia (Village called Cestereg) since I was six month old baby. I came back to Australia when I was 23 years old. My wife Tihana lost everything in a War. She was born in Hodbina, village near Mostar in Bosnia and Herzegovina. We're both Serbians and we celebrate St.Nicholas as our "Slava"(Family saint). Our daughter's names are Greek's origin in respect to the people(Greeks) who helped Serbia through the most difficult times in recent history. As I said, I grew up in a Serbia (it was Yugoslavia then) and we as kids learned that Chetniks were on German's side in the second World War and that Partisans were the only good ones. I always loved history at school, l and I've started to read the books here and I couldn't believe what I've found during my research. It made me angry to find out that I've been brainwashed all my life. The biggest proof of all was to see how Chetniks proudly marching with our allies every Anzac day here in Australia. Sadly, most of the brainwashed Serbian people are so ignorant and lazy to do research on their own and they still believe what they've been told as a kids. During my research on the internet I came up on some articles by Aleksandra Rebic and Julia Gorin about "Halyard Mission". I read all the articles about it and I was so proud of my people who risked and sacrificed their lives to save all those pilots. On Julia's web site I've found the article about Arthur Jibilian and I've asked if she could give me his email address. As we all know Arthur, he was very happy to answer all my questions and inquiries about "Halyard Mission". He even sent me all his photographs and letters from that time. To be honest, before I've get to know Arthur and Julia I was very angry at American people for what they did to us but then I've realized that true Americans are people like Arthur and his family, Julia and all those honest and brave American pilots who fought for the truth all those years. Thanks to them, my kids will grow up with love and respect, not with hatred. 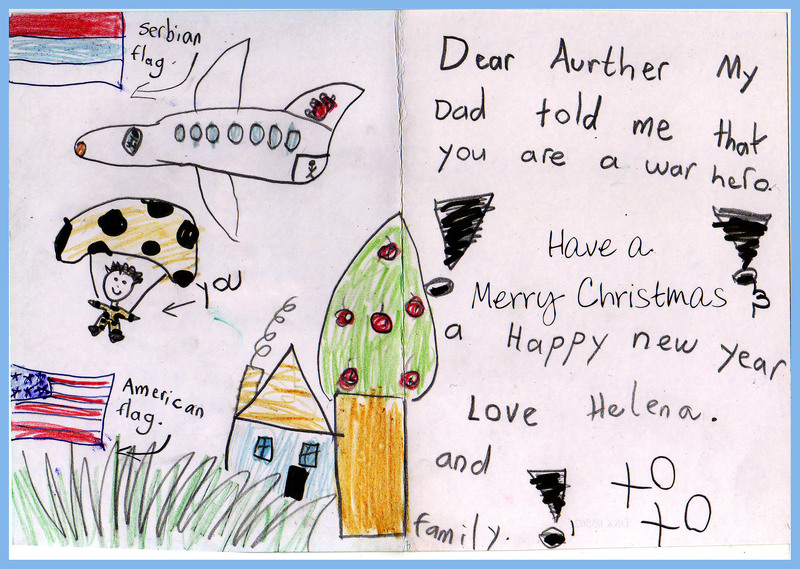 I've told my daughters story about "Halyard Mission" and asked them if they can draw a Christmas card for Arthur. They come up with very cute drawing, and I'm very happy that Arthur liked it so much. I didn't have that privilege to meet Arthur in person but I feel like I'd know him all my life. I'm very honored to call him a friend and I hope that I can fulfill my promise and make the film about "Halyard Mission". Merry Christmas/ Happy New Year! "For U.S. airmen trapped in Yugoslavia during World War II, building a secret airstrip was their only way out." 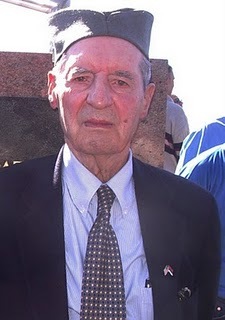 George Vujnovich in 2004, in Serbia. 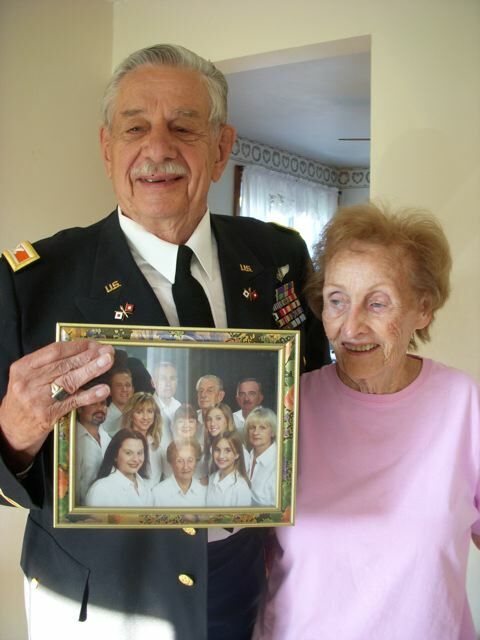 On Oct. 17, 2010, George Vujnovich was recognized by the U.S. Government with the BRONZE STAR for all of his efforts in rescuing the 500+ U.S. Airmen from his post in Bari, Italy. Capt. Vujnovich's daughter, Xenia, speaking about her Dad at the award ceremonies in NYC on Oct. 17, 2010. To view the image larger, just click the bottom right hand corner of the photo above. Called: "The Last Hero of the Halyard Mission." Click on the lower right hand side of this image to read all about Milton Friend going to Serbia to testify about General Draza Mihailovich. An American whose U.S. Air Force bomber was shot down over the Balkans during WWII is on a new mission in the region: Correct a historic injustice against a former Serb guerrilla leader. In the summer of 1944, Lt. Col. Milton Friend's B-24 Liberator was downed by German fighter planes over central Serbia. He said Gen. Draza Mihailovich saved his life in the largest air rescue of Americans behind enemy lines during a war. The former Air Force navigator, 88, is to testify at a Belgrade court today at a hearing to exonerate the Serb general whom Yugoslav communists sentenced as a Nazi collabor and executed in 1946. "Mihailovich was "not a villian, but a hero!" Friend said Thursday. About 500 U.S. pilots and other airmen were downed over Serbian between 1942 and 1944 while on bombing runs targeting Adolf Hitler's oil fields in Romania, according to U.S. Government field station files. Along with the Americans, some 100 British, French and Canadian airmen also were saved in the rescue operation. Friend said the airmen were hidden in villages by Serbian guerrilla fighters, known as Chetniks, were were led by Mihailovich. The prewar military officer launched the first Balkan resistance against the Nazis in 1941.